Everyone claims to have THE best brownie recipe. I have been looking for a good and simple recipe for a long time and I have to say, the best one I found in the cookbook classic Joy of Cooking, a must-have in every household. 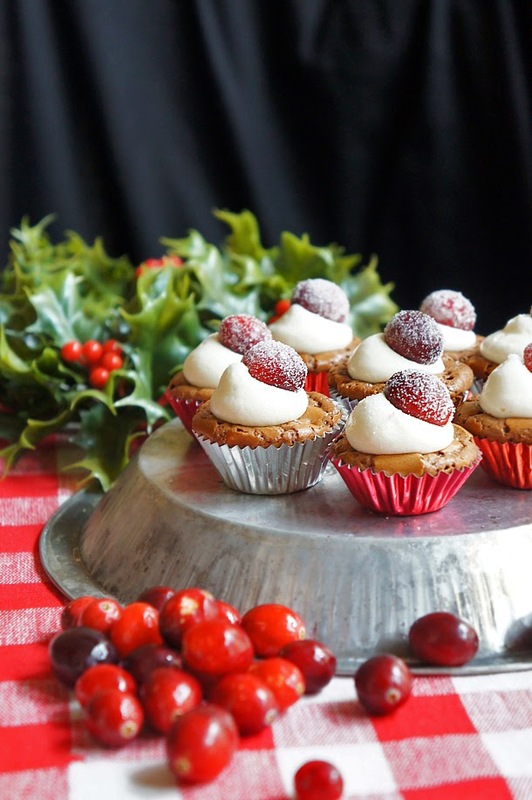 I made a few changes to the recipe to make them more “christmasy” and I just went ahead and made the full batch although I only needed half the recipe for 24 cupcakes. But a few extra brownies won’t hurt anyone, am I right? To make the brownies, melt chocolate and butter in a double boiler and let cool for about 30 mins. Preheat the oven to 350°F / 180°C. Beat the eggs and the salt until light and fluffy, about 2 minutes. Add the white and brown sugar and keep beating until creamy, for about 2 more minutes. Slowly stir in the cooled down chocolate mixture by hand, then add the sifted flour, cinnamon, cocoa powder and cranberries. Carefully fold it into the batter by hand, don't overmix. Using a teaspoon, fill half of the batter into the lined mini muffin pan. Pour the rest of the batter onto a 8x13 inch baking sheet to make some brownies. Bake at 350°F / 180°C for 15-20 mins, leave the baking sheet with the brownies in for about 25 mins. Let them cool down. To make the cream cheese topping, mix the cream cheese with the powdered sugar using an electric mixer. If the mixture gets to dry, add a few drops of milk. Don't add too much milk since your frosting will turn too liquid very quick. 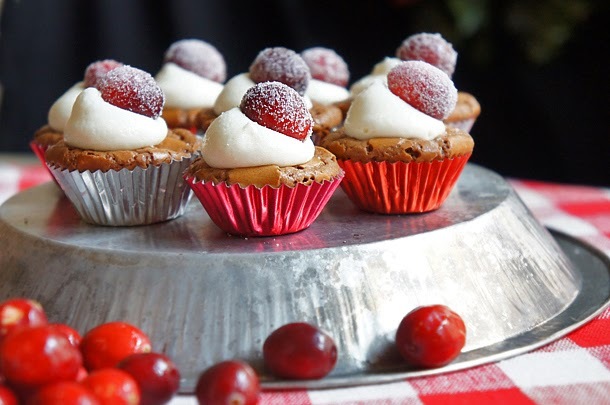 Using a round wide piping tip, pipe some frosting onto the brownie cupcakes. 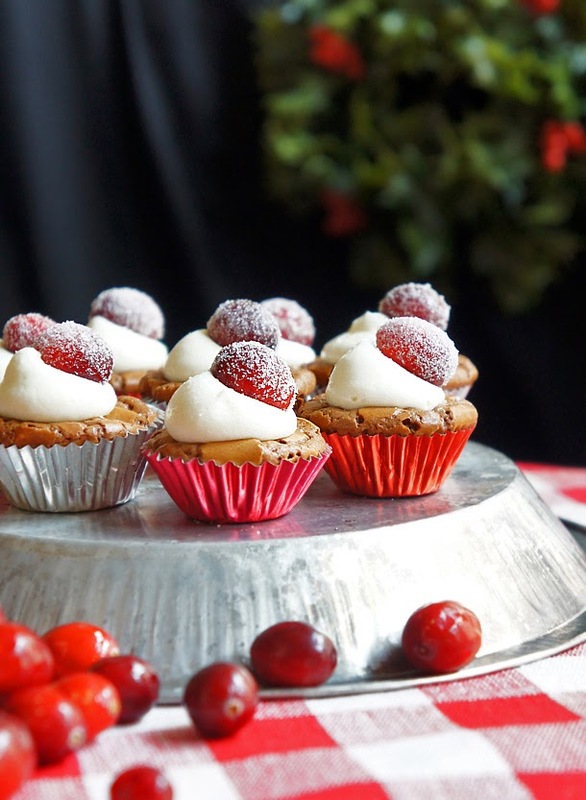 Roll the wet cranberries in sugar and place them on your cupcakes.